We did not have a single injury let alone any deaths. ALL BABIES WERE PAIRED BACK UP WITH THEIR MOTHERS. These advocates had to go through hours of pictures to find a picture that they could take out of context to post on their face book and web pages along with some heart tugging headlines to stir the emotions of their readers. We almost always can accurately predict what they will use. One of the first pictures posted and still being used is a picture of a horse that reared up for a few seconds in the trap. Then there is pictures of the two foals that were captured by roping and the stud horse with a previous injury that was carefully driven in by the helicopter. Next comes pictures of the burros and one of a wrangler carrying a little burro to the trailer. While we may be able to predict what the advocates will post we are always shocked by the terrible comments a lot of the readers post because they only see what the advocates want them to see. Wish they would just come out to a gather and see for themselves or at least go to our website www.wildhorseroundups.com and read what really happens when the pilots are herding the animals to the traps? 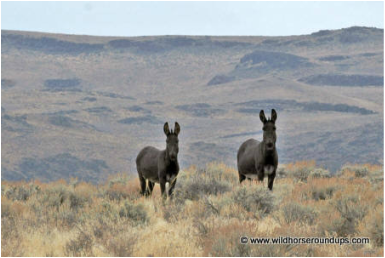 Read why it is so much more humane to gather wild horses and burros with a helicopter than doing it with saddle horses. Why don’t you read the letter we received from Mark Deesing a colleague of Temple Grandin after he came and observed a gather and our handling procedures? We do these roundups as humanely as they can possibly be done and we are very proud or our wranglers and our pilots. These advocates that observed this roundup have pictures of the pilots herding the bands of animals from a long ways away just letting them travel at their own speed. They have pictures of the wranglers carefully sorting off all small foals from the others so they will be safe. They have pictures of the Judas horse leading the animals into the trap and the wranglers shutting the gates then quickly dividing the animals into small groups so they will not crowd each other. They have pictures of sorting the studs from the mares and loading the animals into the trailers. Their pictures would show the animals divided in each trailer so as not to crowd each other. They have pictures of how humanely any animals that had to be roped were handled. Even Laura admitted that the roping was done humanly as she responded to our comments on face book with the following “the rider matched the foals stride perfectly, then threw the rope at pace and close proximity. The foal was then slowed and shown he had something on his neck – by giving slack.” And remember we are working with not domestic animals but wild animals. And to close everyone needs to know that these feral horses are not War Horses that were turned out on this range. They are what were left of the rancher’s horses that he grazed in this area before the ranches were bought out by the Sheldon Wildlife Preserve. These ranchers may have at one time sold horses to the army for calvary horses and they also sold the horses to the army for meat for the soldiers to eat.